“Four more hours?” We had just survived the Bay Area’s Friday rush hour traffic and stopped for gas in San Rafael. The drive up to Humboldt County was longer than Kevin and I had remembered. 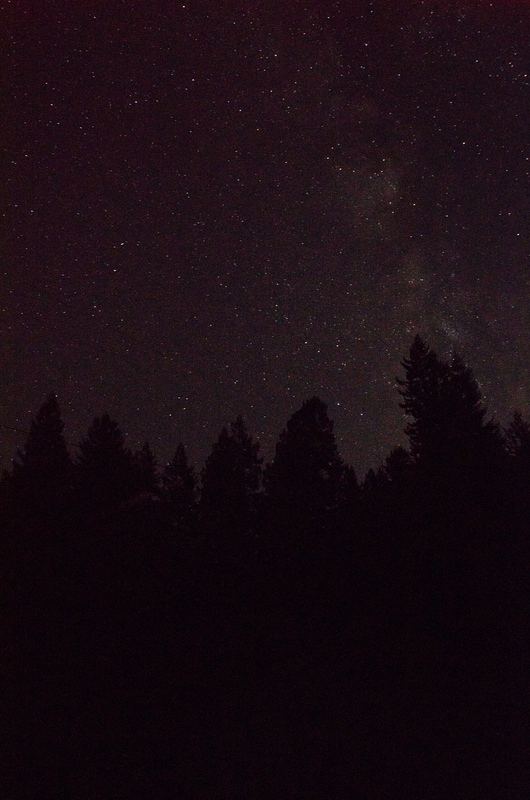 When we pulled into our friend’s house in the woods near Eureka that night, I breathed in the crisp air, saw this sky full of stars, and remembered why the long drive was worth it. 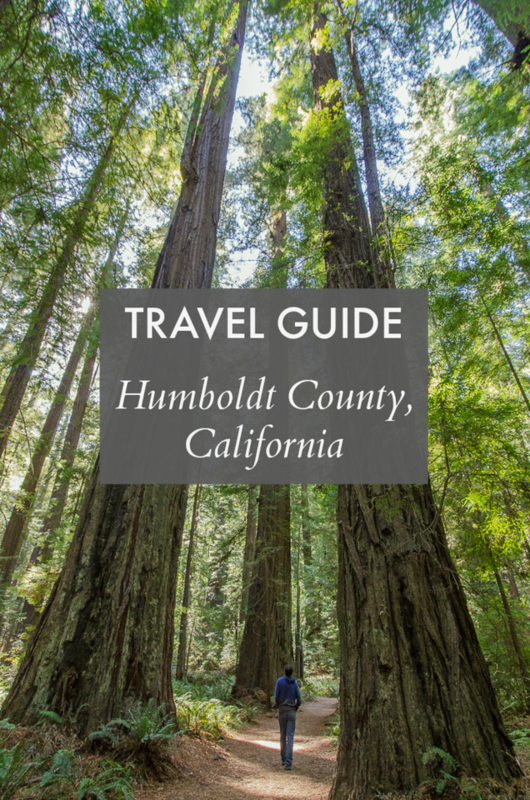 Still, Humboldt is just far enough past the Northern reaches of the Bay Area that it gets fewer visitors than other parts of the California coast. When I was planning the trip, my usual source of travel inspiration, Pinterest, turned up lots of beautiful photos (many that I shared there myself after our last trip!) but few useful resources with both photos and addresses of things to do. So, I figured I’d write one myself. 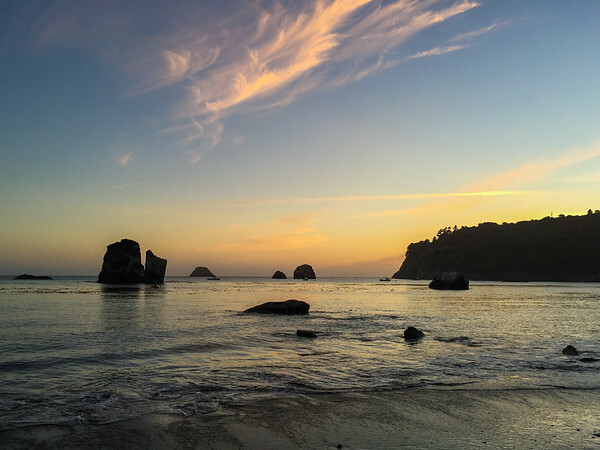 Here are some of my favorite things to do in Humboldt County, California. I included address and directions when possible, because cell signals and data service are weak in remote parts of the region. Do your mapping and online trip planning research when you are in your hotel, Eureka, or Arcata. 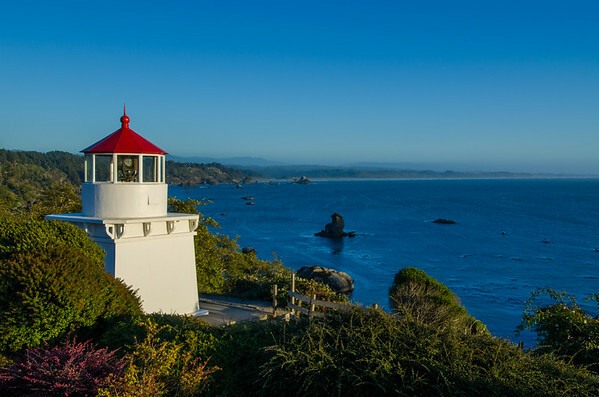 Bonus: Try this “selfie scavenger hunt”–take a photo with four of the Humboldt County landmarks on this list, and the local visitor’s bureau will send you a t-shirt. If you could do only one thing in Humboldt County, I’d say drive and hike through the Avenue of the Giants. The Avenue of the Giants is one of California’s–and the world’s?–great scenic drives, passing through more than 51,000 acres of ancient coast redwood groves. The road (CA-254) runs for 31 miles parallel to the 101 freeway. The south entrance is about 6 miles north of the town of Garberville. The north entrance is about 5 miles south of the town of Scotia. Follow signs marked, “Avenue of the Giants”. There are several hiking trails and different tall tree groves off this road to explore. Some of the biggest trees in the area are on the Roosevelt Grove. My favorite, though, is the Founders Grove. 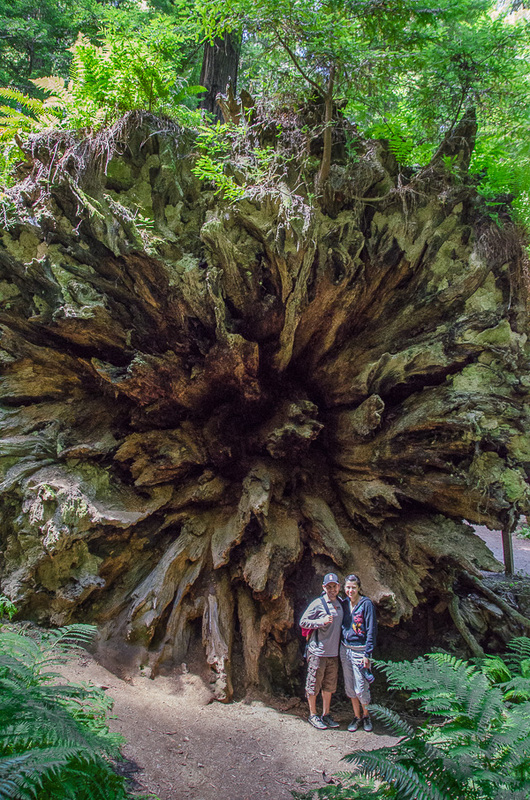 On this short (1 mile loop) trail, you’ll see lots of tall trees including one of the largest fallen trees in the forest, The Dyerville Giant. When this tree fell down back in 1991, you could hear it and feel it for more than a mile around. It sounded like a train wreck–which makes sense, they estimate the tree weighed over a million pounds. Kevin has a soft spot in his heart for this tree because he actually saw it standing back when he visited the park as a kid. His family was heartbroken when they heard that it fell, but standing beside it sure puts the scale of these trees in perspective. On the drive through, be sure to look for a roadside stand called Flood Plain Produce–they’ll have a sign out by the road. This stand sells seasonal organic produce grown on site and is famous for their wild blackberry popsicles. We discovered them when we were up there back in 2012 (photo here), and Kevin and I stopped there again this past weekend. 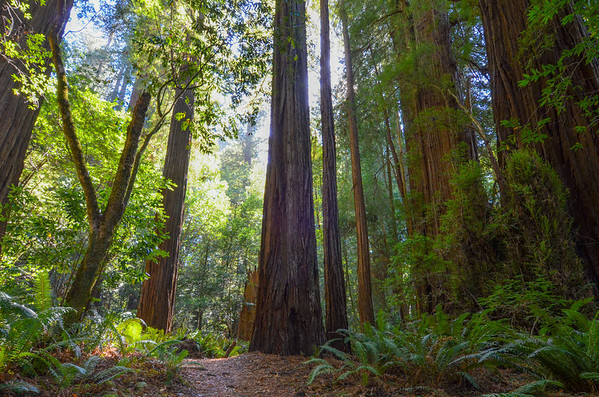 The other publicly accessible groves of tall trees are the Redwood National and State Park, jointly managed by the U.S. National Park Service and the California State Parks. 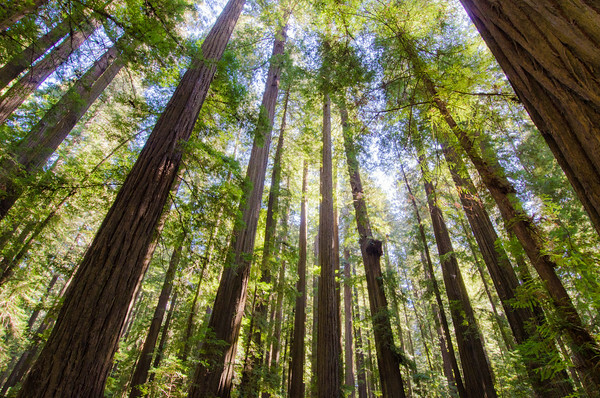 This forest is home to the actual tallest tree in the world, named “Hyperion”. While you can’t visit this tree — it’s in a very remote part of the park — you can see many others. 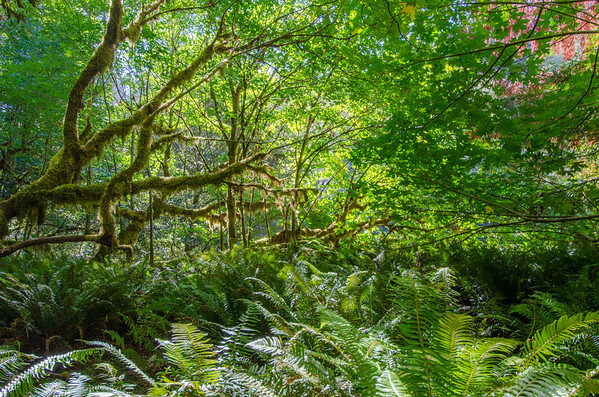 Our friend recommended we visit the “nicest grove in the park”, Tall Trees Grove. It has fewer tourists because it’s behind a locked gate and you need a permit to access the grove. 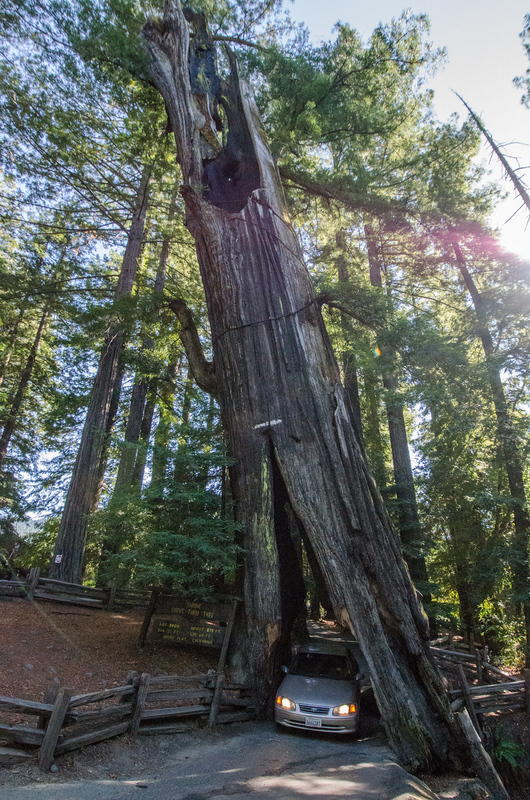 But it’s free and easy to get the permit–just go to the park Visitor’s Center in Orick and tell them you want to visit the Tall Trees Grove. On the way south from the park, look for the Roosevelt Elk in the fields by the road. 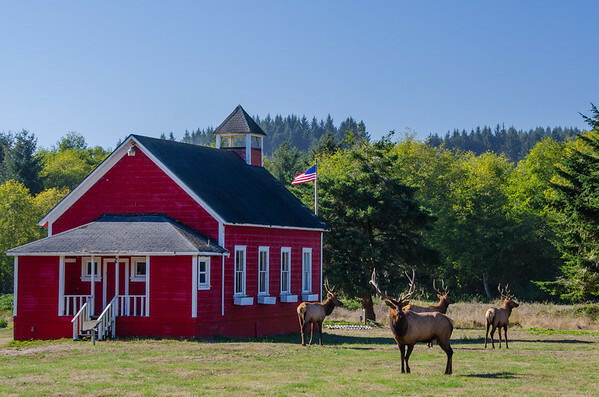 There is a herd that often hangs out outside of the Little Red Schoolhouse across from Stone Lagoon [map]. Be careful, the elk look tame but they can be dangerous. Keep to a distance and don’t get in between the males (horns) and the females (no horns). 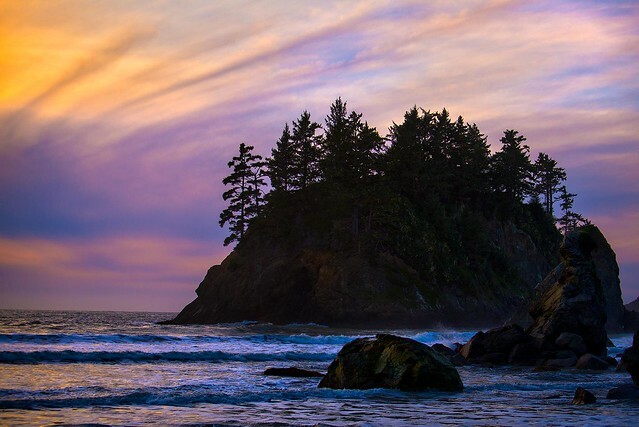 A beautiful stop on the coast is the village of Trinidad, California. Trinidad Memorial Lighthouse is on the cliff, erected as a memorial to those who died at sea. Hiking down the hill from the lighthouse, you’ll come to a small beach in the Trinidad Bay called Old Home Beach. It’s a nice view at sunset. One of the strange and beautiful places that we visited was the Samoa sand dunes and jetty, at the southern tip of the beach. The dog-friendly beach allows dogs to run off-leash, so our mutt, Posey enjoyed a romp on the trails. 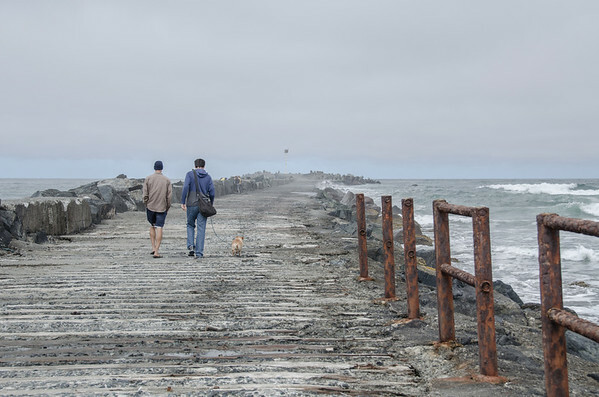 The North Jetty is a pier jutting out into the ocean to protect the Eureka harbor from the surf. 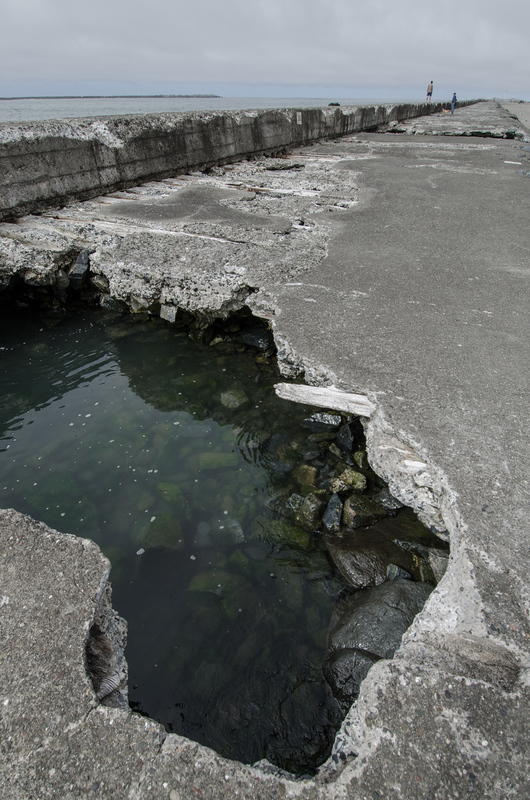 There is former road along the pier that is now being washed away by the powerful ocean currents. It was interesting to see the decay. 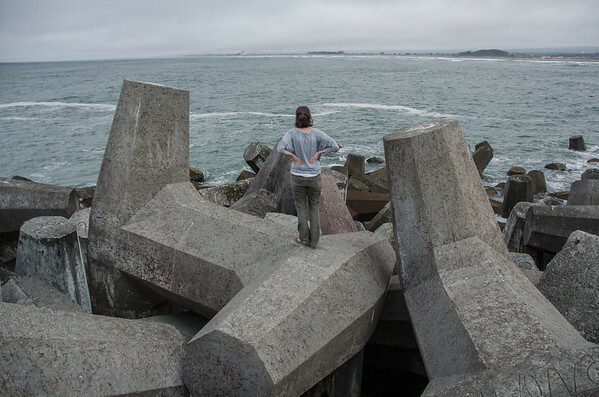 The end of the jetty includes hundreds of dolos, meant to protect the harbor from the strong waves. They look like giant toy jacks standing fifteen feet high. Only after we walked to the end of the jetty, running away from powerful waves crashing on the platform in front of us, did we notice a big red sign that says “Danger: Deadly Waves at Any Time.” Oops! Government officials recommend that you only approach the jetty at low tide. If water is spraying over the top of the jetty, as it was when we were visited, it is too dangerous to walk out offshore. 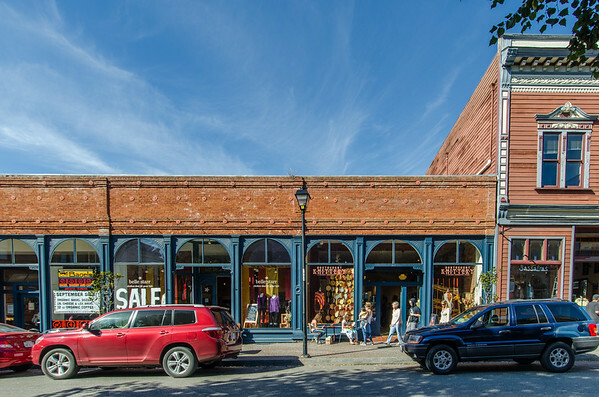 Spend some time exploring the shops in the little downtown area. 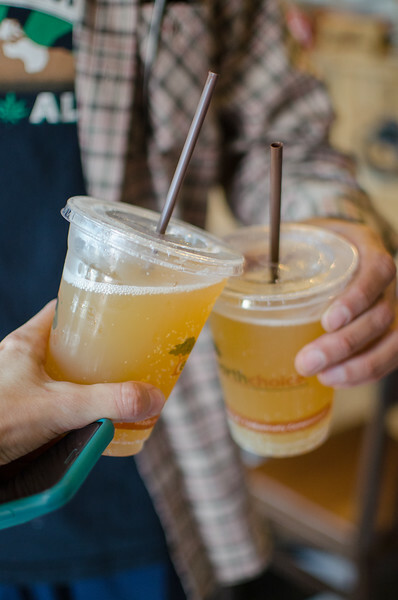 I enjoyed stopping for a bagel and coffee at Los Bagels (see below) and browsing the medicinal herbs (but not those medicinal herbs), teas, and more at Humboldt Herbals. This ornate mansion is apparently the most photographed Victorian house in the US. You can probably see why. It’s like something out of a fairy tale, or perhaps a vampire movie (I’m not alone in thinking it looks creepy). 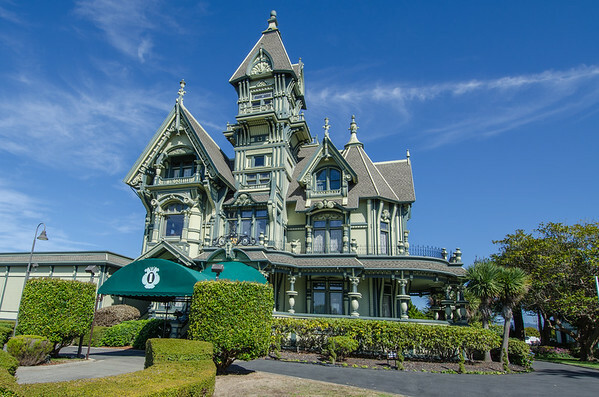 This unique home, now a private club, is one of Eureka’s most recognizable landmarks. The Carson Mansion is lit up at night and offers especially extravagant displays through the holiday season. You can admire it from the outside only — there are no public tours. 143 M Street, Eureka. 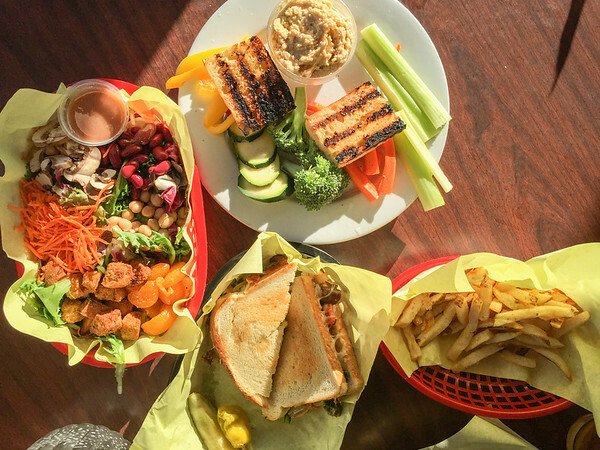 The quirky local market is just as unusual as its eccentric college town community–vendors sell everything from locally grown quinoa to carnivorous plants. The market is open every Saturday from 9am-2pm through mid-November. Check website for exact dates. Arcata Plaza, Main Street, Arcata. The last surviving “lumber cookhouse” in the West. Lumberjacks and mill workers would come for a big hearty meal. The food is served family style, it’s all-you-can-eat, and great for feeding hungry kids or folks with big appetites. 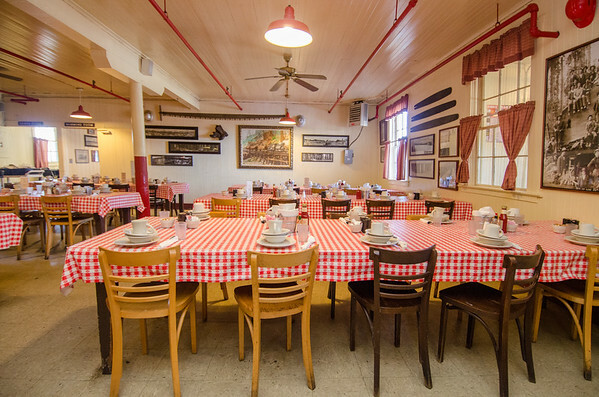 The dining room is decorated with saws and historic photos of lumberjacks. They also have an interesting little Logging Museum on-site. 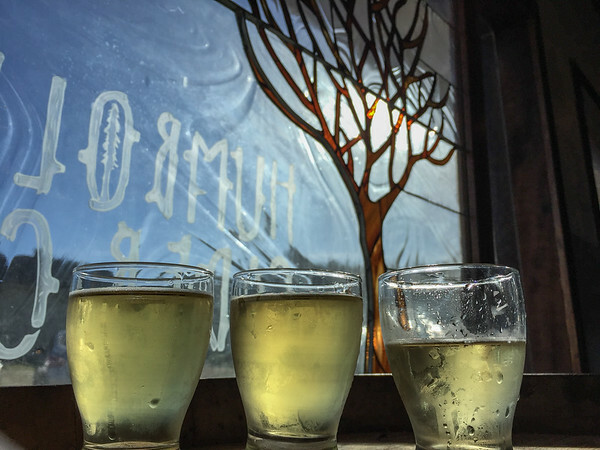 Good food and craft beers and a big outdoor patio. They had a very spicy Chile Ale that I loved. 101 Taylor Way, Blue Lake. 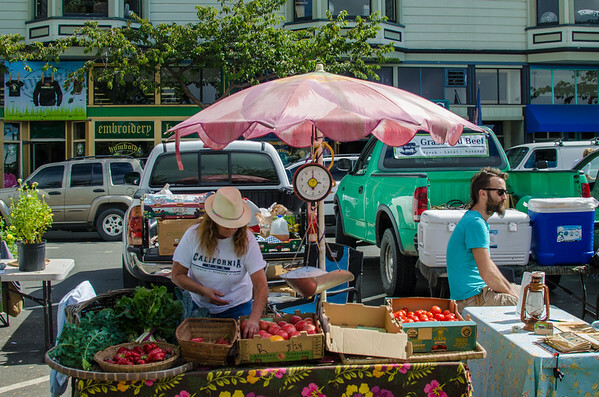 Arcata Farmers Market. See above. Eureka Natural Foods. Large natural food store–a locally owned version of Whole Foods. 1450 Broadway, Eureka. Costco. If you’re a member. 1006 W Wabash Ave, Eureka. I don’t have any hotel recommendations, but for camping, we once stayed at the Hidden Springs Loop campground in Humboldt Redwoods State Park. It’s the perfect location for a first trip to the area–right on the Avenue of the Giants highway. While I found it a little unsettling at first, I learned to love the rhythmic creaking sound of the tall redwoods swaying overhead. It was also a short walk to the South Fork of the Eel River, where we found a swimming hole that we had all to ourselves. 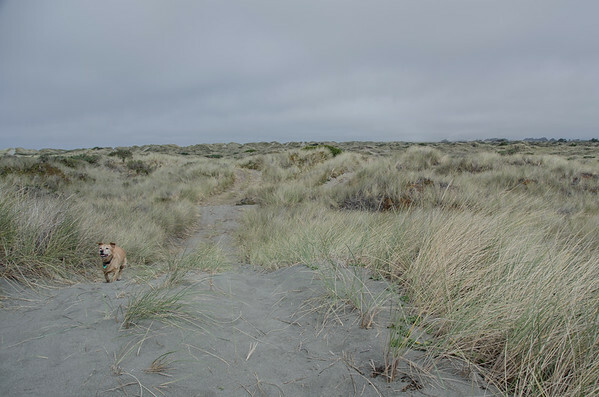 These beaches allow dogs to run off-leash: Clam Beach, Big Lagoon, Moonstone, Luffenholtz, Mad River County Park, and the Samoa Dunes Recreation Area. Dogs are allowed on-leash at most other county and state parks. Dogs are prohibited from all trails within the redwood groves, though they are allowed in developed areas and campgrounds. The only dog-friendly hiking trails are the Arcata Community Forest, Redwood Park (Eureka), and Rohner Park (Fortuna). 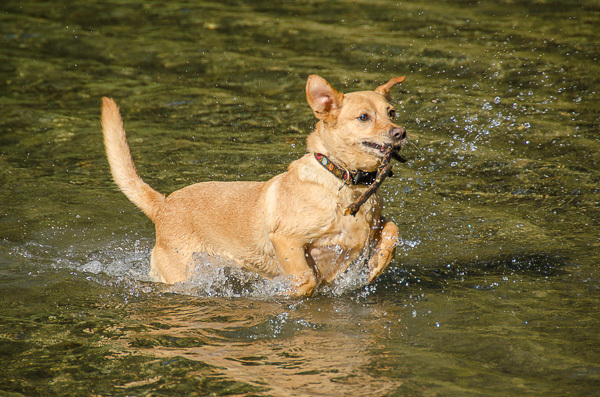 Note: Many of Northern California’s freshwater lakes, rivers, and streams are prone to a seasonal bloom of blue-green algae that causes liver failure in dogs–the outbreak this summer killed a few dogs who ingested water while swimming in Mendocino and Humboldt County rivers. If you go in the summer or fall, ask locals if it’s safe to let your dog in the river. If it’s bloom season, be sure to keep your dog on leash and away from the water. Our meal at the Samoa cookhouse was hosted by the restaurant. Opinions are my own. Ever been to Humboldt County? What would you add? Yes, we really wanted to take Posey into the woods, but she had to stick to the beach. Luckily, it seemed pretty well marked. People were talking about it, and we saw warning signs posted in a few places around town. I think it is just a seasonal thing and you’d be safe planning a winter trip. Let me know when you go! We want to go back and see our friend who just moved there. Oh, nice! Thanks for sharing that memory, Christianna! I’m excited to read your post! I’ve been wanting to get up there for a long time, and this guide is giving me a lot of inspiration. Those photos of the tree that had fallen over and the memorial lighthouse are great! I was wondering if you could tell me about how many hours you spent exploring the avenue of the giants? I’m going to be in the area with my husband and kids for a wedding in June and we would love to see as much as we can while there. Thanks in advance!